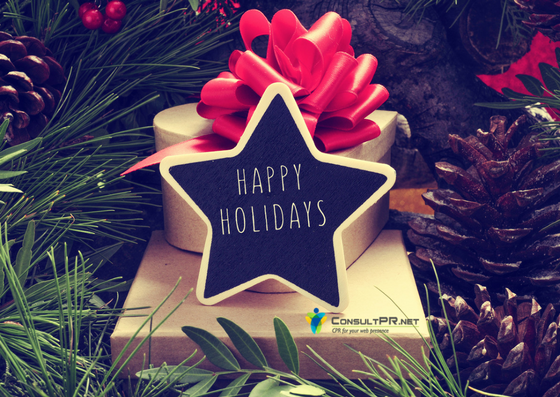 Happy Holidays From The Team At Consult PR, Inc. This season, may you find time to enjoy life's simple blessings and the beauty of each quiet moment. The entire Consult PR family, would like to thank you for your continued patronage and trust in our services, and to let you know how much of a privilege it has been to serve you this year. Our relationship with you is one that we truly treasure. We all tend to get so caught up in the hustle and bustle, that we often forget to look around and enjoy the beauty of the moment. But, wherever you find yourself this holiday season, we encourage you to stop and savor the moment. Best wishes for a joyous holiday season and our sincere thanks for your loyalty and goodwill. May 2018 bring you an abundance of prosperity, good health and great happiness.